← First Batch of Big Leaf Maple Syrup! Apparently, it is quite possible to have a week so busy that there isn’t even enough mental energy left over to post even a teeny tiny blog post. Three completely different presentations in three different municipalities on two days didn’t help… Snow, sleet, rain, slush, and endless mud was a bit of a problem. The arrival of our first ever workaway helper (M. C. from Germany) was most excellent, but also threw off the regular routine. A deluge of emails of all sorts wasn’t much help… Our lovely neighbours heading for the south seas on a cruise leaving me in charge of an extra horse isn’t that unusual, but it always takes a few days to readjust the schedule… Randomly deciding it was a good thing to bake bread was tasty, but maybe not so well timed. And so on. Somehow I wasn’t even able to upload this quickie photo of determined crocusses… crocci? pushing up through the snow. This evening, finally, it feels like I might be able to get back to some sort of regular posting routine. There’s certainly no shortage of goings on to provide the raw material! This entry was posted in Blog, Uncategorized and tagged crocus., farm life, too busy, winter. Bookmark the permalink. Good morning and welcome back. We figured you’d been busy. My blogging “schedule” has been erratic, too. That’s partly because of busyness and partly from lack of motivation to post. It’s all okay. Thanks, Melanie – it’s good to be back! We headed for the grocery store this morning to get breakfast, coffee, and some supplies. As we sat and chatted, your blog came up. We noted how it has been a few days. Must be busy with stuff. I am always heartened by the snowdrops and crocuses that remind me spring really, truly is on her way despite all evidence to the contrary! Me, too. We are not near that point yet here. In fact, two mornings this week are likely to go sub-zero. Those will be #29 and #30 for this winter. But, the flowers are down there, waiting patiently. Good. Yes, it’s good to have you back – it was kind of like missing morning coffee! 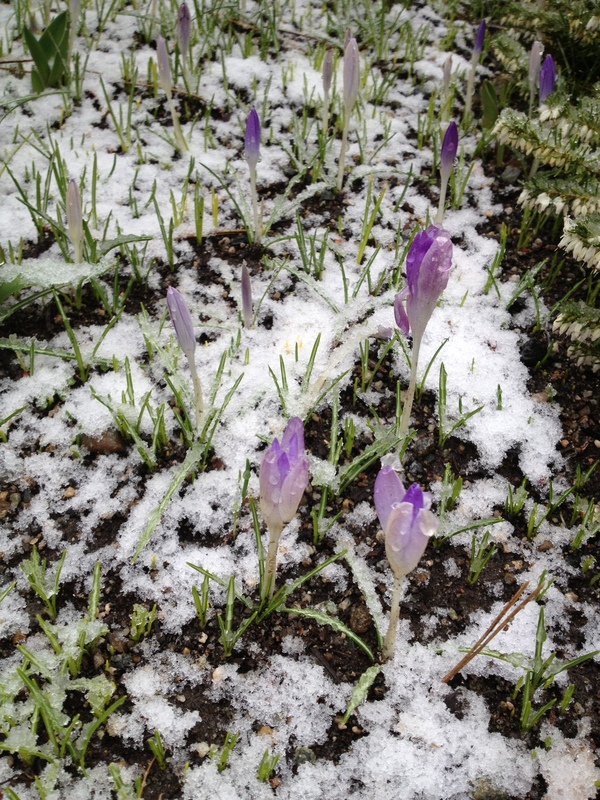 A happy hopeful picture of the crocuses (or croci ) too.